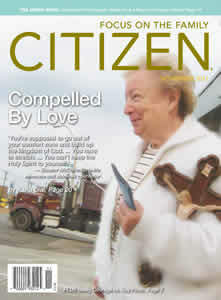 This article originally appeared in the November 2011 issue of Citizen magazine. The refrigerator in Eleanor and Joe McCullen’s Newton, Mass., home is covered with photos. Babies alone. Babies with their moms. Toddlers. Elementary school kids. Entire families. You might expect that, considering that the McCullens, both in their mid-70s, are grandparents. The thing is, these kids aren’t relatives. They’re just a few of the hundreds of children born after Eleanor met their moms on a sidewalk outside an abortion clinic over the last 11 years. It’s nothing she ever imagined she’d be doing at this point in her life, but in the year 2000, Eleanor — a lifelong Catholic — had a personal encounter with the Holy Spirit that turned her life upside down. “It was like St. Paul being knocked off his horse,” she says. “I was going to Mass, but this was a deeper conversion. Eleanor had no idea how she was supposed to “stretch” herself. Married at the time for 41 years, she’d spent her adult life as a homemaker, raising three children and then her grandchildren. Stripped of excuses, Eleanor reached out trepidatiously to Christian sidewalk counseling ministries. For the first four months, she simply prayed while other counselors talked with women outside a local Planned Parenthood abortion clinic. But one day, a counselor was out sick and Eleanor was asked to fill in — and a whole lot of lives began to be affected, one by one. Every Tuesday and Wednesday morning, between 7 and 11 a.m., you can find Eleanor dressed in a suit, pushing a baby stroller outside an abortion clinic. In the stroller are a portable DVD player that shows a baby’s ultrasound and a stack of pamphlets for pregnancy medical clinics in the area. Over the years, she’s found it’s amazing how far a simple greeting can go. As gratifying as it is to help a distressed pregnant girl into her car and take her to A Woman’s Concern — a 19-year-old pregnancy medical clinic with four locations statewide — to get an ultrasound, as joyful as it is to see the tears flow when that girl decides abortion will not be her choice for this child — for Eleanor McCullen, it’s not the end of her work. It’s just the beginning of new relationships. That’s been her approach since that first fateful day when her colleague got sick, said her husband Joe. That was when the line of girls, women and couples started coming through their front door to their living room — and it hasn’t stopped since. One of Eleanor’s favorite traditions has been holding baby showers for mothers who change their minds. That’s not to say the aftermath of helping women who’ve changed their minds about abortion is all sunshine and roses. A lot of the women Eleanor meets on that sidewalk aren’t there because they personally want to be — they’re there because they feel they have to be, thanks to their parents or boyfriends. That’s not a hypothetical situation. Right now, there’s a 5-year-old kid somewhere in Massachusetts with a young mom and two grandparents who couldn’t be more thrilled that he’s in their lives — thanks to one lady who was willing to step outside her comfort zone. Occasionally, the confrontation is not with people who are considering abortion, but with others who are trying to keep them from it. As a couple, the McCullens haven’t stopped at buying countless strollers and sets of baby clothes for those showers. They’ve helped with rent. They’ve furnished apartments. They’ve bought groceries. They’ve gotten refrigerators fixed. They’ve let women stay at their house in Massachusetts and families borrow their second home on the coast of Maine. The phones in both locations ring constantly — sometimes because women need material support, and sometimes because they just want to talk to Eleanor. Some of them are people she’s been involved with personally — and some are people who have been referred to her by mothers Eleanor has helped in the past. Though Joe, who owns a capital firm, doesn’t join Eleanor on the sidewalk, he gets involved in other ways when she asks. “Eleanor is the front-line soldier, and I’m just in the supply office,” Joe says demurely. “For the most part, probably 90 percent of the cases, these people have turned their lives around. Sometimes these are young men who are struggling to find themselves and be good fathers, live a lifestyle that they aren’t accustomed to. It’s not necessarily the way they were brought up, but they take the responsibility of being a father seriously. They have difficulties, especially in this economy, but they’re good solid people who are doing their best under difficult circumstances, so we continue to support them. Eleanor can tell you about some twins she’s very fond of, though. One of them is named Eleanor. And another is named Joe. Karla Dial is a contributing editor to Citizen and CitizenLink Daily News. We offer pregnancy testing, supportive counseling, prenatal care referrals, assistance in obtaining health insurance, education, career and housing information for those in need of hope, help and love.